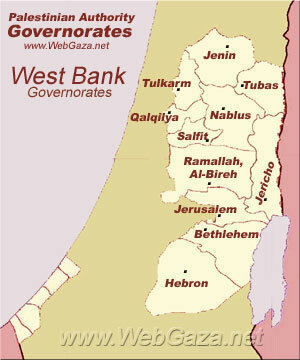 West Bank Governorates - What Are West Bank Governorates? The Jenin Governorate is one of a number of Governorates of the West Bank and Gaza Strip within the Palestinian Territories, it covers the northern extremity of the West Bank including the area around the city of Jenin. The Nablus Governorate is an administrative district of the Palestinian National Authority located in the Central Highlands of the West Bank, 53km north of Jerusalem. It covers the area around the city of Nablus which serves as the muhfaza (seat) of the governorate. The Qalqilya Governorate is an administrative area of the Palestinian National Authority in the northwestern West Bank. Its capital or muhfaza (seat) is the city of Qalqilya that borders the Green Line. The Salfit Governorate is one of 16 Governorates of the Palestinian National Authority. It is located in the northwestern West Bank, bordered by the governorates of Ramallah and al-Bireh to the south, Nablus to the east and Qalqilya in the north. Its district capital and largest city is Salfit. The Ramallah and al-Bireh Governorate is one of 16 Governorates of the West Bank and Gaza Strip. It covers a large part of the central West Bank, on the northern border of the Jerusalem Governorate. Its district capital or muhfaza (seat) is the city of al-Bireh. The Jericho Governorate is one of 16 Governorates of the Palestinian National Authority (administrative districts) within the Palestinian territories. It is located along the eastern areas of the West Bank, along the northern Dead Sea and southern Jordan River valley bordering Jordan. The Jerusalem Governorate is one of 16 Palestinian governorates situated in the central portion of the West Bank. The district capital is East Jerusalem. The total land area of the governorate is 331.6 km2. The Bethlehem Governorate is one of 16 Governorates of the West Bank and Gaza Strip within the Palestinian Territories. It covers an area of the West Bank, south of Jerusalem. Its principal city and district capital is Bethlehem Municipality. According to the Palestinian Central Bureau of Statistics, its population was 180,116 in mid-year 2006. The Hebron Governorate is an administrative district of the Palestinian National Authority in the southern West Bank.